The Kosher Market near us on Santa Monica Blvd (intersection with Butler, I think…) has a very tempting grill outside the shop. And you can buy the marinated meat from the meat counter, although you’ll get strange looks from the guys when you say you wanna cook it yourself. The beef kebabs were very gently spiced, and I have absolutely no idea what was in it, other than tender beef. 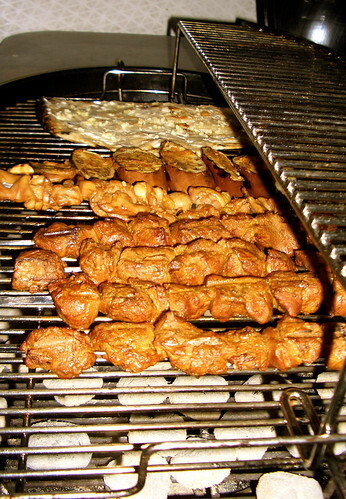 As for the chicken kebabs, they were home-marinated bog-standard D-style teriyaki. Flat bread also from the market, slathered in butter and garlic. I like my BBQ grill.